While my husband Brad and I were backpacking around the world we saw so many architectural gems. Some of these buildings we were very familiar with, while others we stumbled upon, giving us the opportunity to discover new architects. One of the architects we were aware of prior to heading off on our journey was Zaha Hadid. Many times we even went out of our way just to get a glimpse of one of her creations. Hadid was coined as the "Queen of Curve" from London's The Guardian newspaper and many of her buildings have her signature curvature style. She has a fantastic way of creating buildings that seem almost unreal to me. In 2014, the was the first Zaha Hadid building I was introduced to in person. 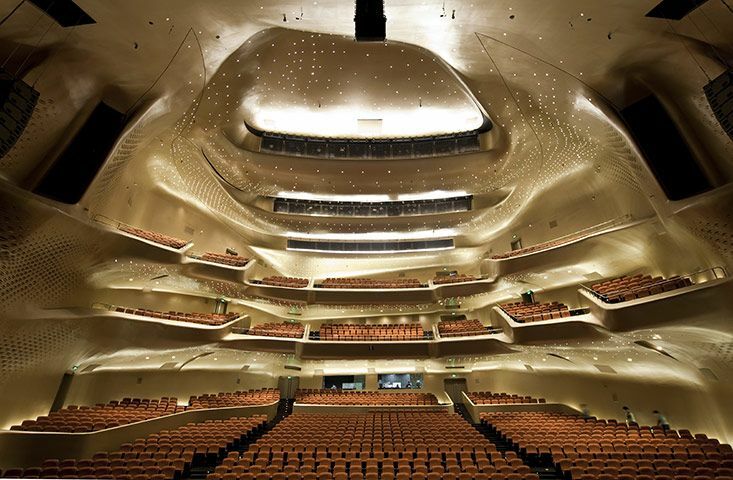 I had no idea who the architect was, but I knew I was in love with the styling and now began my love for Zaha Hadid. What draws me in to this building is how every inch of it feels like it is in motion and flowing with life. This is one of my favorite Zaha Hadid buildings I was able to see with my own eyes. The curvy silhouette reminds me of ocean waves or mountain tops giving it a connection to nature in my mind. It's set directly on the river and houses the Glasgow museum of transportation and was the Winner of the 2013 European Museum of the Year Award. I have not had the honor to see this building yet but I cannot wait for the day it happens. This is probably one of Hadid's most recognizable buildings. 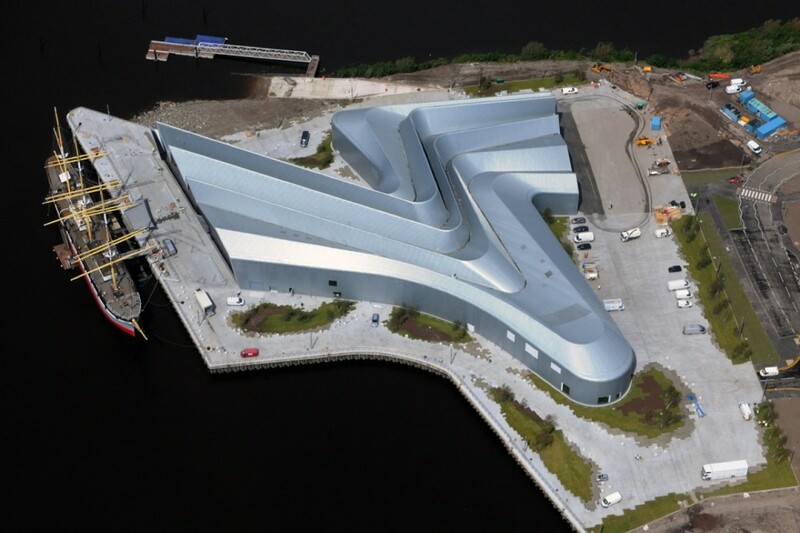 Hadid wrote that "its fluid form emerges from the folds of the natural topography of the landscape and envelops the different functions of the centre." To me, this plaza has a very futuristic alien ship feel and I love it. Much like other Zaha designs, the building moves with every angle. 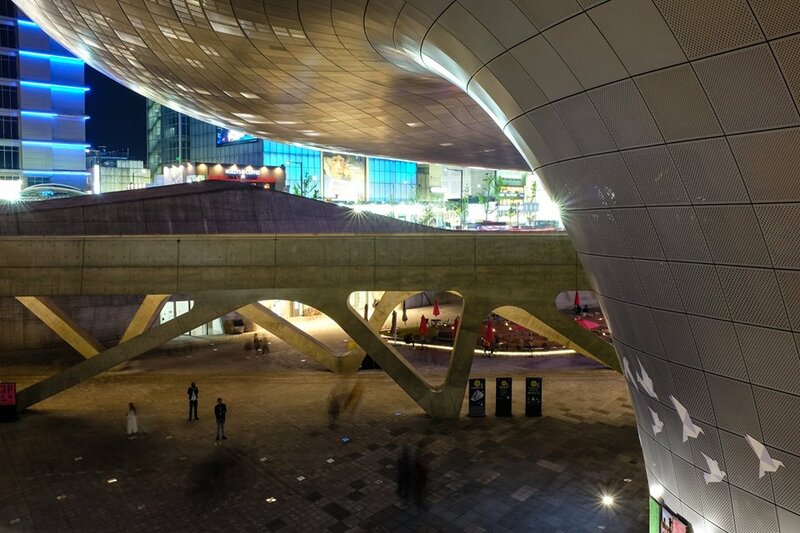 This complex is in the heart of Seoul's shopping district, Dongdaemun, which keeps it alive and buzzing 24-hours a day. Some of the coolest features of this building is it's many ecological features, including a double skin, solar panels, and a system for recycling water. Brad and I happened to be in Antwerp just a few weeks after this building opened. It is a departure from the normal curvy forms Hadid is known for. It was one of her last works opened while she was alive. It opened in 2016 and is Zaha's only government building. The style symbolizes many things for the people of Antwerp. It is the Port Authority building and successfully mixes the old structure with the new. Atop the old building is a sail-like glass and concrete structure. 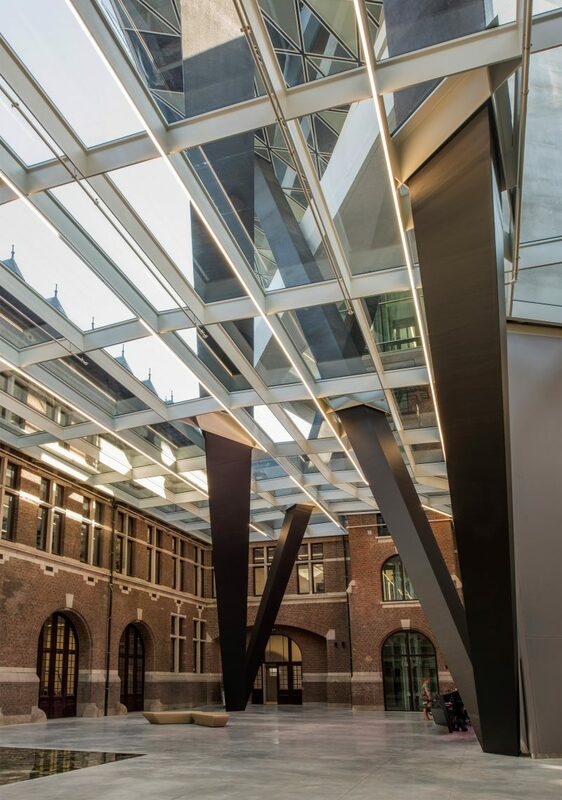 Not only is it a sail to connect with the port, it has a diamond-like appearance to speak to Antwerpt's presence in the European diamond trade. After falling in love with Zaha Hadid's architecture, I asked myself where I could go in the United State to see her work. To my surprise, East Lansing Michigan has one of her designs. I haven't made it to see yet, however, I am itching for a trip soon. Anyone up to go with me? Another building most people with recognize is the London Aquatics Center. It was built for the 2012 olympics. 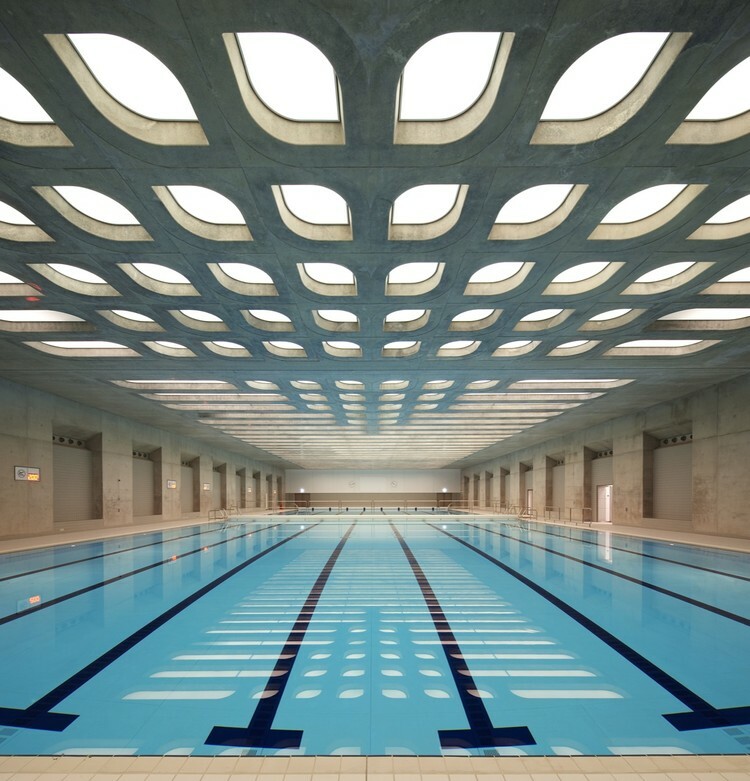 Hadid is quoted saying the building is, "inspired by the fluid geometry of water in movement." The complexity of the roof allows the illusion of constant movement, it also caused the cost of the building to triple from the original estimate. Worth it! 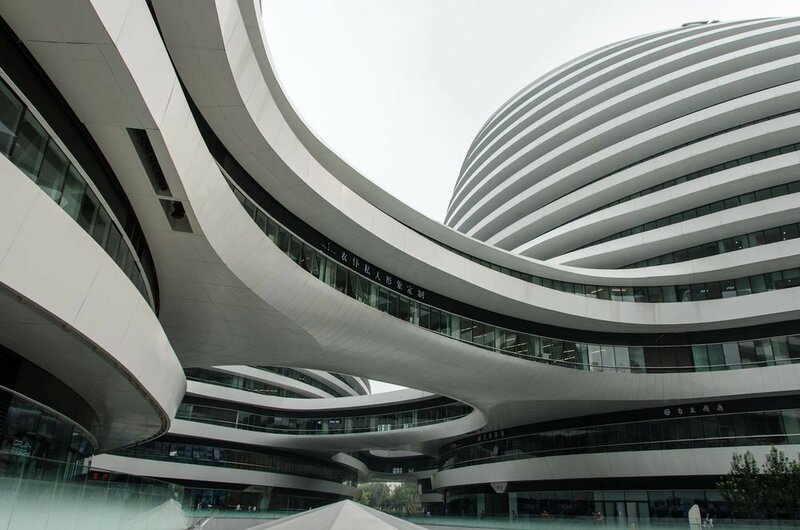 Hadid's first project in China is absolutely stunning. The opera house shaped like a modern day pebble which sits in perfect harmony with its location beside the Pearl River. I have not explored this part of China, but it's on my short list of must visit places! Hong Kong is known for it's bright lights and flashy buildings. Because of this, it's hard to stand out. 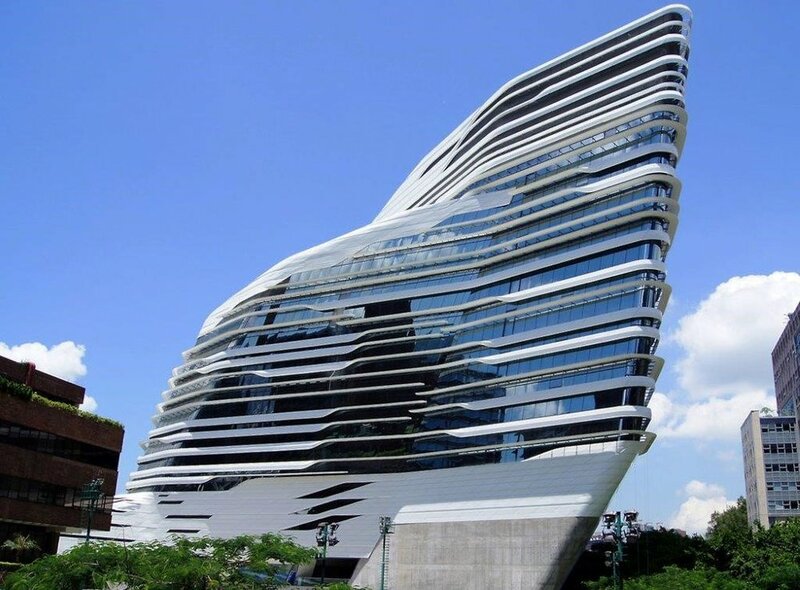 Well, it makes sense that Hadid has a stunning building located here, and it stands out for sure. I hope you enjoyed this gallery featuring fantastic architecture. Next time you are traveling to one of these places, be sure to check out these buildings, it's worth the time!